Mid-week. Crazy work. No food. Yup, it's time for another Weeknight Dinner for the Working Woman (Or Man). Yesterday, I went down to the lunch room at 10:30 a.m. to warm up my lunch. You read right, at 10:30 a.m. on the nose. I hadn't eaten breakfast and figured an hour and a half was enough time to eat lunch before I left for court at noon. Note, it takes me an hour and a half to eat given the 13,864 interruptions while I'm eating. Seriously peeps, just because I eat at my desk instead of the local fine dining establishment (read Sweet Tomatoes) doesn't mean I want to contemplate your case question while reading about how to travel on a budget (yup, I love that NY Times blog). Plus, it's disconcerting for me to slurp my spaghetti with you standing right there. You understand that a spaghetti sauce moustache ruins my professional image right? So if I'm not answering your question, it's not 'cause I didn't hear you but rather, because I'm ignoring you, hoping you'll go away (at least until I'm done eating my spaghetti). Long story short (or short'ish), even after trying to eat at 10:30 a.m., I didn't get to eat lunch yesterday. Though, in the interest of full disclosure, I did have a giant Coke flavored Icee later in the day. And yes, I noticed the ten-year-olds in front of me buying giant Icees as well. Don't hate because I'm young at heart. Maybe I should change the name of the blog to Lawyer Longs for Lunch. I knew that after a day of no food, I'd die if I ate ramen for dinner. For the sake of my innards, dinner had to be relatively healthy. Fish n' Beans it was. Fish n' Beans sounds a lot like Hot Dogs n' Beans but it is not. It is definitely not. As an aside, who actually publishes such a recipe? Add cans of pork and beans, hot dogs, and brown sugar to a crock pot, cook, and serve for dinner? That's not a recipe, that's a heart attack. And that's really sayin' somethin' comin' from a girl with a deep-seated attachment to ramen. I'm the first to admit all recipes don't have to be worthy of Bon Appetit magazine but they have to involve something more than adding canned beans and hot dogs to a crock pot. You can have a pretty decent meal, even after a ten hour work day, so long as you have a meat and a vegetable on hand (and while hot dogs are fun, they don't count as meat). Jeez, forget both a meat and a vegetable, you can even have a pretty decent meal with just a meat or a vegetable. On this fine Wednesday night, the meat of choice was tilapia and the vegetable, gorgeous green beans from the local farmers market. The green beans recipe is courtesy of my favorite Chinese restaurant (they just don't know it). What? I got tired of paying $10 for a plate of green beans when I can make a bathtub of green beans for $10 (ok, closer to $14 but only because I have zero haggling skills at the farmers market). The fish recipe is courtesy of well, me (and probably numerous other people who have their own recipes for quick frys). A quick bath in an egg wash, a dip in a mixture of bread crumbs, flour, cornmeal and herbs, and a pan fry later you have a meal that's worthy of skipping lunch for. Ok, I lie. No meal is worth skipping lunch but this is a meal that will make you never, ever want hot dogs n' beans. Heat oil in large frying pan. Beat egg with a teaspoon of water for egg wash. In a separate plate, mix all dry ingredients together thoroughly. Make sure tilapia fillets are dry (feel free to pat 'em down with a couple of paper towels if necessary). Egg wash and then coat with bread crumb mixture. Pan fry in well, a pan. Serve with a side of Chinese-Style Green Beans or side of your choice. Unless your side of choice is hot dogs n' beans. If so, then I forbid you from making this recipe. Ever. Heat oil in pan. Cook garlic until fragrant. Add green beans. 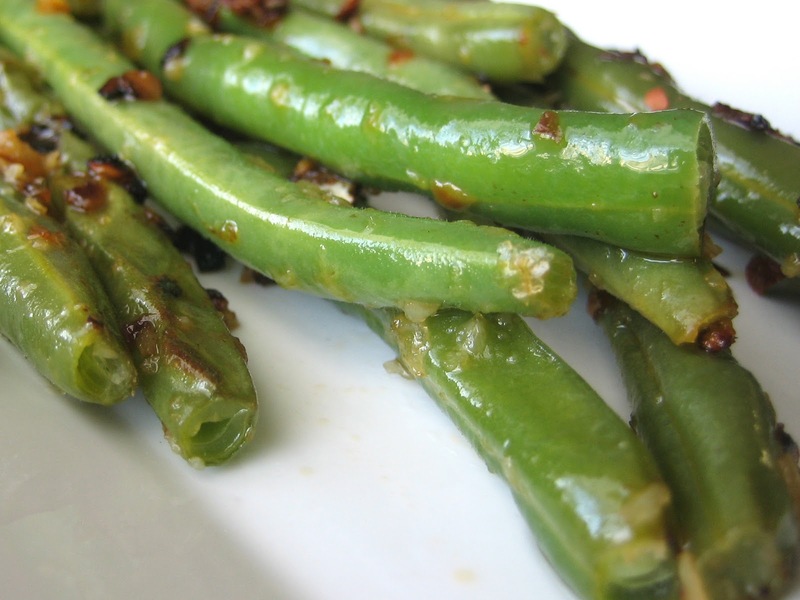 If you like your green beans crunchy, cook them quickly in the pan for a few minutes. If you like them a bit softer, add a few splashes of water and a lid, and cook them for a few minutes with the lid on and the heat turned low. When the beans are as crunchy (or as soft) as you like, add chili garlic sauce and salt and pepper to taste. Turn the heat on high. Stir fry for a quick minute or two. Plate. Eat with fingers. As long as the fish doesnt taste fishy im all game..weird rt? but true? im in England, the land of fish and chips and how i detest it...and my husband the exact opp..the fishier the better..opp poles attract..true eh? The fish looks outstanding. I love tilapia but had to get over an episode of Dirty Jobs in which Mike Rowe worked a tilapia farm (the whole bottom feeder thing is a little disgusting). Tasty, tasty meat though. I really love tilapia and green beans, so thanks for the great recipe. I would have never thought to put the two together, why? Because I don't have a creative bone in my whole body. Oh girl, dont skip lunch too often! I'm eating lunch at my desk as typing hehe and one call interrupted me..ugh. I couldn't imagine if I have 10,000things interrupting! I love fish. Fish and beans sound really good for a healthy dinner after a long day! Oh, I couldn't agree with you more that homemade cook is way better and cheaper than eating out at a restaurant. I love that you had an ICEE. You are my type of girl! A lovely meal with a kick! This fish and beans are calling my name. I love how delicate the fish looks and the green beans...so fresh and crisp. I need to go out and buy me a few fillets. haha.. this post was so cute! i'm surprised you were able to take pictures of your food before you ate, after starving all day! Your days sound like mine! Azmina, What a yummy healthful lunch. Love the color of your perfectly cooked fish and the green beans which are LOVELY! 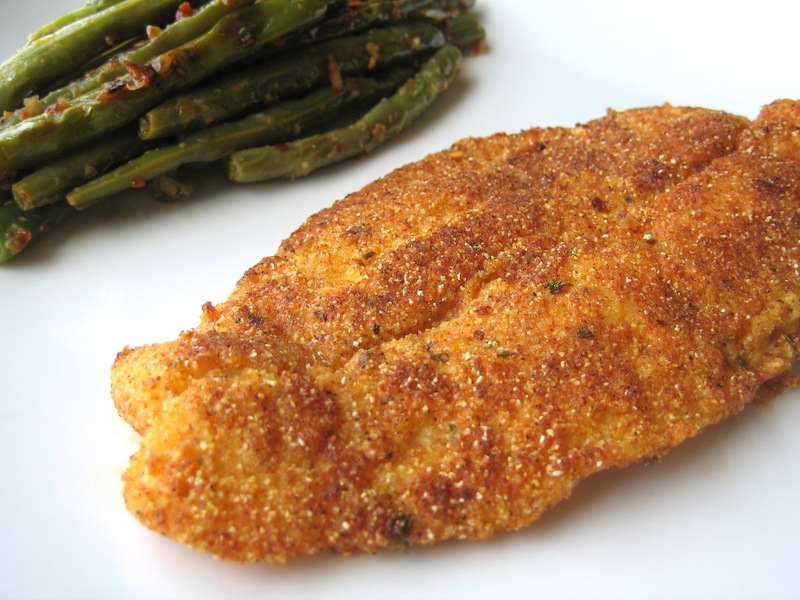 The cornmeal is such a great addition to regular pan fried fish...must add wonderful texture. I love Tilapia... that too with green beans... what a healthy combo! What a great lunch! I grew up on pan fried fish! Esp. tilapia, quite a fave with my filipino family! I love the WDWW series... coming up with it was a stroke of sheer genius! Love the recipes.. that fish looks seriously crispy and crunchy! Lovely post, great dish. And my favorite, fried fish. LOL, spaghetti mustache. You got a very busy schedule. Happy 4th. I prefer your current name...but I can see how "Lawyer Longs for Lunch" may be fitting:( You need a lock on your door! For the meal here...my kind of dinner! Of course mention cayenne, fish and a veggie and I am at your doorstep. Don't fix your name if it ain't broke!! I like it! The tilapia looks fantastic and the green beans are just calling my name! I still can't get over the fact that you attempted to eat lunch at 10:30 am to no success! You should make bite sized chunks of the fried tilapia, put them in a paper coffee cup. Put the beans in another paper coffee cup and try eating that for lunch. This guarantees you a mess-free, fuss free lunch that you can eat easily while answering everyone's questions. Love the speedy WDWW plus the photos. Your talapia looks perfectly pan fried. I usually steam my fish but my kiddies like crunchy foods so this would be the perfect recipe for them. And don't you love how quick and easy it is to cook Chinese grean beans? The fish looks great! I always ruin fish when i try to make it at home. Azmina! You just won the box of cookie cutters!!! My Sweety picked you :) Congratulations :)))) Please do email me your address so I can send the present to you as soon as possible. Kudos to you, girl! You still manage to come with a gorgeous dish after working a 10-hour day. Do make room for breakfast though, you won't have to compete with the kids for the Icees. hehe. That Tilapia looks really good! I am sorry about your lunch situation. I have an annoying office mate, who loves talking to me when I am stuffing my mouth with my lunch.So annoying! 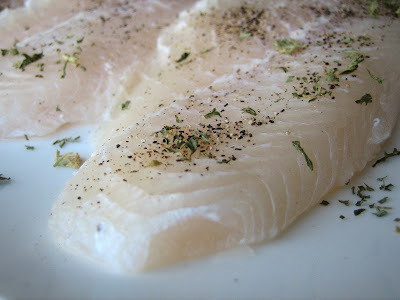 An Open Book- I've found that tilapia is the least "fishy" fish. It's really mild and takes on the flavors you pair it with. Lemme know how you like it! Tanantha- Phone calls are the worst because you can see your lunch getting cold but can't do anything about it! Thehungry- I'm a bit ashamed to admit I've had an Icee almost every week this summer! Mysocalled- Oooh, Dr. Pepper Icees! I'd definitely have stopped too! Monet- It's amazing how crispy they are, without even resorting to deep frying. Baking- You really can't go wrong with an Icee! Kate- That makes me feel a bit better! Fathima- It was healthy (and tasty)! Le- I didn't know tilapia was common in Filipino households! It's pretty new to mine but I'm a fan! Madin- A happy belated 4th to you and yours! Magic of Spice- A lock would be ideal! Katy- I'm so glad you agree. I hope I'm never grow too old for slushees. Kristin- Tilapia is quite possibly the most forgiving fish ever. It's delicious, even when served in broken bits (don't ask how I know). You should give it a try! Zurin- Yay! I'm so excited! Jam cookies, here I come! Sweetlife- I blame my Icee obsession on the heat but truth be told, I just really like Icees! 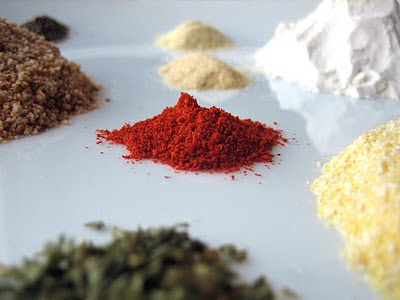 Cayenne pepper is delicious with tilapia.